CALGARY, Aug. 1, 2018 /CNW/ - Trinidad Drilling Ltd. (TSX: TDG) ("Trinidad" or "the Company") is announcing the conclusion of its previously disclosed strategic review. Trinidad also announces the addition of John R. Blocker, Jr. to its Board of Directors (Board). Since beginning the strategic review on February 20, 2018, Trinidad and its financial advisor have evaluated a number of alternatives and their potential to enhance shareholder value, including a sale of select assets and a corporate transaction. The Company continues to review certain non-core asset sale opportunities, but has decided to conclude the formal strategic review process. After a comprehensive public process, the proposals that Trinidad received did not fully reflect the value of the Company. The Board has determined that the best alternative to improve shareholder value is to pursue Trinidad's revised five-year strategic plan, capitalizing on the Company's operational excellence, strong customer base, geographic diversity and solid financial position. A number of strategic changes made over the past year are now beginning to be reflected in Trinidad's financial results. "Trinidad has a strong asset base, an improved cost structure and a solid financial position," said Brent Conway, Trinidad's President and CEO. "We are confident that we can create value for shareholders with our commitment to improved financial discipline, ongoing focus on driving better efficiency and financial performance, and further aligning management and the Board with the interests of shareholders." As an outcome of the strategic review and in its drive to become a leader in the North American oilfield services business, Trinidad has clearly defined its five-year strategic plan. The plan is founded on the four key initiatives listed below. 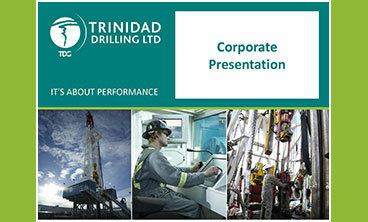 Trinidad expects that strong performance in these key initiatives will build shareholder confidence and value. In addition, improved world oil prices are allowing Trinidad to negotiate longer-term, higher-margin drilling contracts. The combination of these factors is expected to drive improved financial performance and returns. Trinidad is focused on improving its financial discipline, streamlining its business, and is committed to generating free cash flow to reduce indebtedness or buy back shares. As previously announced, Trinidad has executed on certain asset sales, including the sale of three Saudi Arabian rigs and the anticipated sale of surplus facilities, with expected gross proceeds of approximately $88 million. Trinidad continues to focus on improving its cost structure efficiencies for both operating costs and G&A expenses. In 2018, Trinidad expects to deliver a reduction of more than 25% in G&A expenses, compared with 2017, excluding one-time costs associated with the restructuring and strategic review. In addition, Trinidad will continue to evaluate further opportunities to leverage its current asset base through strategic mergers or acquisitions. The Company will also continue to evaluate underperforming assets for divestiture and will streamline its business by eliminating non-core business structures, such as small joint ventures or partnerships. Trinidad continues to demonstrate operational excellence driven by the Company's in-demand, high-quality asset base and strong customer relationships. As previously announced, the Company is completing a selective rig upgrade program which is targeted toward high-specification rigs and strategically focused in key US and international plays. Trinidad's fleet is well positioned to meet the demands of customers and is seeing the benefits of improved market conditions through higher dayrates, increased utilization and strong margins. In addition, Trinidad has been able to improve the visibility and stability of its international operations by adding several new contracts for its joint venture rigs. Trinidad's fleet has shown its adaptability through its ability to move to new regions to achieve higher returns and to meet customers' changing needs. The Company will continue to evaluate further opportunities to relocate equipment to higher margin areas where customer demand is strong. In addition, Trinidad will continue to evaluate fleet upgrades that meet the Company's target full-cycle return metrics of 20% or more. Trinidad will evaluate these opportunities in conjunction with its free cash flow commitments and return targets, while also ensuring they provide the Company with higher contract visibility. Trinidad will also leverage its existing customer base and high-quality fleet to increase the exposure of its technology platform and generate strong financial returns with minimal capital investment. As part of the strategic review process, Trinidad's Board and management have engaged with major shareholders to obtain their perspective on Trinidad's strategy and performance. This feedback, along with Trinidad's ongoing corporate governance program, have driven changes to the Company's compensation program to improve shareholder alignment. These changes include clearer performance metrics for short and long-term incentive plans, a capped bonus pool, and the addition of a clawback policy. In addition, changes made to Trinidad's board composition, including appointing a new chairman and adding a new independent director, have reduced the average tenure of the board and added complementary skills. The Company's executive team has also increased its share ownership levels. A significant portion of the directors' remuneration is composed of deferred share units, which mirror Trinidad shares and which must be held until retirement from the Board. Trinidad's Board and management will continue to engage with shareholders, providing clear communication of the Company's objectives and strategies with well-defined and measurable goals. In addition, Trinidad is currently implementing increased share ownership requirements for its senior management team, to drive further shareholder alignment. The Company also expects the share ownership levels of the Board to increase. Finally, the Board is actively considering additional directors to further complement the skill set of the current directors and provide ongoing renewal of the Board. Trinidad has a successful history of developing rig technology, and the Company is continuing to build on that track record with the implementation and expansion of its technology platform. The platform includes CriterionTM (directional optimization software), GMXSteeringTM (completion optimization software), downhole tool supply, electronic data recorders and Trinidad's internally-developed technologies. The technology platform provides a competitive advantage with enhanced margin opportunities for Trinidad and its shareholders. Trinidad is currently building customer awareness of its technology platform by partnering with key high-quality customers, conducting pilot projects, and rolling out equipment to its existing fleet. Growing customer understanding of the technology platform's benefits and its value proposition is expected to drive increased deployment through the remainder of 2018 and beyond. As Trinidad's technology platform grows and becomes more material, the Company expects to provide additional financial and operating metrics to assist investors in measuring its contribution and performance. Activity levels in Trinidad's US and Canadian operations increased in the second quarter of 2018 over the levels recorded in 2017, as a result of improving commodity prices and strong customer demand. In the US, Trinidad's activity levels continued to grow, up 24% over the second quarter of 2017, despite concerns regarding weakening demand in the key Permian play. In Canada, activity increased 24% over the same time last year as activity rebounded quickly following spring break up. Trinidad is well positioned for ongoing success in the Permian. The Company's Permian customer base is largely made up of oil and gas producers that have secured firm transportation commitments for their production and are continuing with their development plans. Trinidad has not incurred material reductions to its customers' plans in the Permian, and while the Company continues to monitor the transportation bottlenecks in the area, it is confident that its Permian operations will continue to perform strongly. Trinidad is pleased to announce the appointment of John R. Blocker, Jr., of Houston, Texas, to its Board of Directors, effective August 15, 2018. Mr. Blocker, Jr. adds extensive US and international operational experience and expands the Board to six independent directors. Mr. Blocker, Jr. has over 40 years of diverse experience in E&P and contract drilling services, in both the domestic and international markets. He spent over 13 years with Pride International, Inc. (NYSE: PDE), starting as in-country manager in Argentina before being promoted to Vice President – Latin American Operations and Senior Vice President – Worldwide Operations, and was Chief Operating Officer until his retirement in 2006. From 1986 to 1993, Mr. Blocker worked as a consultant and also founded a small drilling company and a downhole tool company. From 1975 to 1986, Mr. Blocker worked at Blocker Energy, Inc. where he started as a floorhand and subsequently served as Chief Operating Officer and a Board member. He currently manages private oil and gas investments via Blocker Energy, Inc., and serves as President & CEO of Maxxen Energy and Business Development Advisor for Wild Well Control, Inc. in Latin America. Following the release of its second quarter and year-to-date 2018 results, after market close on August 7, 2018, Trinidad will be hosting a conference call on August 8, 2018. The Company will also address the conclusion of the strategic review and the details of the initiatives underpinning its five-year strategic plan during this call. Adjusted EBITDA is used by management and investors to analyze the Company's profitability based on the Company's principal business activities prior to how these activities are financed, how assets are depreciated and amortized and how the results are taxed in various jurisdictions. Additionally, in order to focus on the core business alone, amounts are removed related to foreign exchange, share-based payment expense, impairment expenses, the sale of assets, and fair value adjustments on financial assets and liabilities, as the Company does not deem these to relate to the core drilling business. Adjusted EBITDA also takes into account the Company's portion of the principal activities of the joint venture arrangements by removing the (gain) from investments in joint ventures and including adjusted EBITDA from investments in joint ventures. Adjusted EBITDA is not intended to represent net (loss) as calculated in accordance with IFRS. Adjusted EBITDA is calculated using 100% of the related amounts from all entities controlled by Trinidad where Trinidad may not hold 100% of the outstanding shares. Adjusted EBITDA margin percentage is used by management and investors to analyze the Company's profitability relative to its revenue generation. Adjusted EBITDA margin percentage is calculated as adjusted EBITDA divided by revenue. G&A as a % of revenue is used by management and investors to measure the level of the Company's general and administrative costs (G&A) relative to the revenue generated. G&A as a % of revenue is calculated as G&A costs, before share-based payment costs and third-party recoverable costs, divided by revenue. Return on Capital Employed (ROCE) is used by management and investors to measure how efficiently the Company uses capital to generate profit. ROCE is calculated as adjusted EBITDA for the trailing 12 months divided by the average of total assets less current liabilities for the beginning and ending periods. Trinidad's ability to identify and add new directors. general economic conditions including the capital and credit markets. Trinidad cautions that the foregoing list of assumptions, risks and uncertainties is not exhaustive. The forward-looking statements contained in this document speak only as of the date of this document and Trinidad assumes no obligation to publicly update or revise them to reflect new events or circumstances, except as may be required pursuant to applicable securities laws. Trinidad's strategies and objectives as set forth above reflect Trinidad's current intentions and are based on current facts and industry conditions. Trinidad reserves the right to amend its strategies and objectives from time to time. For a full discussion of the Company's material risk factors, see Trinidad's annual information form for the year ended December 31, 2017 and risk factors in other documents filed from time to time with securities regulatory authorities, accessible through the SEDAR website (www.sedar.com).